Ginger has long been used to support healthy digestion, relieve occasional upset stomach, and may assist the body in eliminating excess gas from the intestinal tract. Ginger is known as one of the healthiest warming spices on the planet. Its medicinal properties are used to calm digestion, reduce nausea, muscle pain, and inflammation. Ginger has long been used to support healthy digestion and may assist the body in eliminating excess gas from the intestinal tract. Strong scientific research shows ginger to be beneficial for reducing nausea specifically for pregnant women. 1. Tripathi S, Bruch D, Kittur DS. Ginger extract inhibits LPS induced macrophage activation and function. BMC Complement Altern Med. 2008;8:1. 2. Zadeh J, Ko N. Physiological and pharmaceutical effects of Ginger (Zingiber officinale Roscoe) as a valuable medicinal plant. European Journal of Experimental Biology, 2014, 4(1):87-90. 3. Wu KL, Rayner CK, Chuah SK, et al. Effects of ginger on gastric emptying and motility in healthy humans. Eur J Gastroenterol Hepatol. 2008;20(5):436-40. 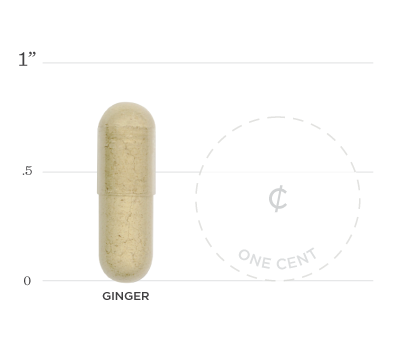 Ginger Root (Zingiber officinale), Cellulose (capsule), Magnesium Stearate (vegetable source) and Silica. 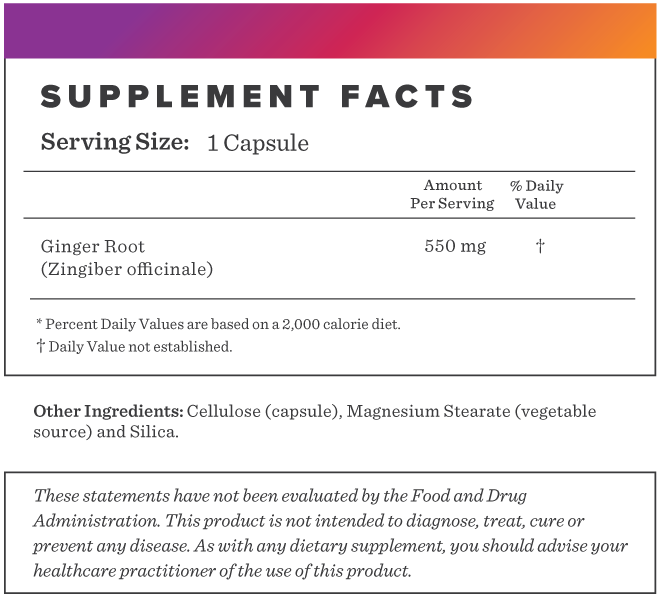 Below we've broken down the main functions of our Ginger and the benefits it can provide. It can lower inflammation by inhibiting pro-inflammatory molecules to reduce harmful inflammatory responses in the body. Ginger has been shown to increase muscular activity in the digestive tract, relieve constipation, and improve digestion and absorption. Ginger has also been compared in effectiveness with popular anti-nausea medications. One study showed ginger to speed up the emptying of the stomach by 50% in 24 healthy individuals who consumed 1.2 grams before their meal. Research points out supplementing with ginger can help those who suffer from indigestion.